Are you seeking the right solution for new Design-ins or Diminishing Manufacturing Sources and Material Shortages (DMSMS) Components? Download or request a printed version of our new 8-page catalog to learn how DATEL's capabilities can help resolve your new design, obsolescence, End-of-Life (EOL) or reduced access to qualified legacy product issues. Preview all DATEL product categories in our new shortform catalog including Data Acquisition Components, DC-DC Converters and Filters, Digital Panel Meters, Process Monitors and Modified and Custom Designs and Solutions. 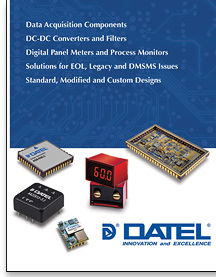 DATEL is an established supplier of Data Acquisition and Analog products, including industry's best A/D and D/A Converters, Sample-Hold Amplifiers, CCD Signal Processors / Imaging Converters, Multi-Channel Data Acquisition Systems and many other customs Multi-Chip Modules (MCM). We maintain MIL-PRF-38534, Class H Certification to offer our customers many features and capabilities, including: MIL-STD-883 Screening, Customized Testing and Packaging. In addition to our standard product offering, DATEL offers custom designs for new and legacy systems, form-fit-function replacement for obsolete components, build to print manufacturing and custom thick-film substrate manufacturing services. DATEL, Inc specializing in custom multi-chip solutions to replace or enhance obsolete microcircuits!